My toddler loves strawberries. She requests that I always cut off the leaves, and insists that I do NOT sugar them, and then can eat roughly half a pound a day. She essentially exists on strawberries, cherry tomatoes, and cheese. It’s a good life. Because we always need to have strawberries on hand for her, I buy a carton every time I see them (sort of like milk – it’s never on the list because it’s ALWAYS on the list) – the grocery store, Costco, Target, etc. So sometimes I don’t pay enough attention and end up with 5 pounds of strawberries. While my little cutie COULD consume 5 pounds of strawberries in a matter of days before they go bad, it would be awfully hard on her stomach. Enter strawberry shortcupcakes. 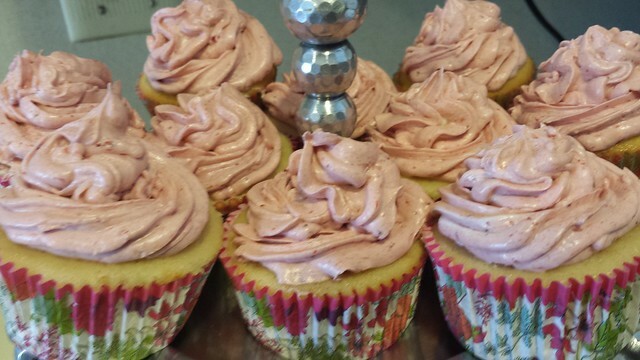 They’re basically a vanilla cupcake with a strawberry balsamic filling and a strawberry buttercream on top. Pure heaven. Unfortunately my strawberry-lovin’ daughter takes books very seriously and had recently become obsessed with Pinkalicious before I made these. In the story, the little girl makes pink cupcakes with her mom, eats too many, and turns pink. To my two year old literalist, it was not a risk worth taking, so she wouldn’t eat them at all. Her loss. Note: if you don’t have/want to buy cake flour, you can substitute AP flour, just take 2T of each cup out and replace it with cornstarch. Also, all in all, you’ll need 5 sticks of butter, 1.5-2lbs of strawberries, and 9 eggs so, just be aware. These really are a lot of work, but if you’re looking for something impressive and outstanding, their worth the effort. I’d recommend baking the cupcakes the evening before, and filling/frosting the next morning. 1. Preheat the oven to 350. To make the cakes, begin by beating the butter and sugars together until light and fluffy. Add in the eggs, one at a time, and the vanilla. Stir the dry ingredients (flour, baking powder, and salt) together and alternate adding the dry ingredients and the buttermilk until everything is incorporated. Fill cupcake liners to 2/3 full (mine made roughly 24). Bake for 15-18 minutes until a toothpick comes out clean. Allow the cupcakes to cool completely before proceeding. 2. To make the filling, hull and finely dice the strawberries and toss with the sugar and balsamic vinegar. Allow the mixture to set while you core the cupcakes. You can either use a knife or a handy coring tool (like this). Spoon a bit of the strawberry mixture in each cupcake until full – sort of mashing the strawberries in with the back of the spoon. They can mound a little over the top, they will be covered by the frosting. 3. To make the frosting, hull and roughly chop the strawberries and toss with balsamic vinegar. Cook the mixture over medium heat in a small saucepan for several minutes until fragrant. Allow to cool. Meanwhile, stir the egg whites and sugar together in a heatproof bowl over simmering water, whisking constantly until it hits 160 degrees. Transfer to a stand mixer with the whisk and beat on medium high until the mixture is completely cool and stiff peaks form. This takes 10-12 minutes for me. While it’s beating, pour the strawberries into a blender or food processor and blend until smooth. Put it in the freezer while you finish the frosting so it’s nice and cool. Once the stiff peaks are achieved, turn the mixer down a notch or two and add in the butter, in small chunks until it’s all incorporated. Bump the speed back up and beat another 4 minutes until the frosting is fluffy. Add in the strawberry puree until incorporated. 4. Frost the cupcakes using a piping bag to cover the strawberry filling. If you yield 24 cupcakes: 352 calories per cupcake, 18g fat, 31g sugar.